This paper deals with the creative use of audio-visual materials and theatre techniques in catechesis for a desirable outcome. Concepts such as Divine pedagogy as well as the Pedagogy of Jesus serve to be a theoretical framework for this paper. Going deeper into what they signify I would present some novel dimensions of creative use audio-visuals and theatre techniques in catechesis. From the discussion of these ideas I would develop some fresh orientations about how we should approach catechesis in the postmodern cultural context. As a conclusion it is established that a creative use of audio-visual materials and theatre techniques within the framework of Divine Pedagogy will result in a relational catechesis, which leads to building communities. The Biblical literature offers us some vivid images and powerful imageries. Old Testament Theophanies are examples of some most captivating visuals of God and other divine phenomena (Niehaus, 1995; Savran, 2005). Bible presents a visual culture where text becomes the image (Harvey, 2013). At the heart of this visual culture – better read as experiential culture – is the incarnation where word becomes flesh (Jn 1:14). Word is abstract while flesh is concrete. The culmination of God’s communication occurs when in “these last days” he speaks “to us in His Son” (Heb. 1:1). This revelation – God’s way of communicating and teaching – can be called as the divine pedagogy (White 2014). However, we shall not limit God’s pedagogy to mere images presented in the Bible. The phrase Divine Pedagogy describes the manner in which God teaches the human race. The central element of the divine pedagogy is the idea of adaptation. “God willing to speak to men as friends manifests in a special way his pedagogy by adapting what he has to say by solicitous providence for our earthly condition” (GDC :146). It is nothing but God coming down to the level of children like a good Father in order to raise them up as his children. The fascinating aspect about God’s pedagogy is that it is highly relational in character (See Osborne 2009). God’s own pedagogical strategy for teaching humanity provides the example for catechists to be imitated. Divine revelation provides both the content and methodology for catechesis. Jesus is master teacher and he has a special method of teaching which employs a range of creative ideas. We need to go deeper into the pedagogy of Jesus to continue his teaching mission here on earth. The starting point of Jesus pedagogy is incarnation while it culminates in the death on the cross and the glorious resurrection. It is pedagogy in which Jesus completely identifies with humans – emptying Himself and being made in the likeness of men (Phil. 2: 8). Taking the likeness of man signifies a visual language. As an answer to Philip’s request to show him the Father, Jesus replies, “He who has seen me has seen the Father” (Jn. 14:8) (For more details on cultural adaptation of Jesus’ incarnation read Vallikatt 2013). Fascinatingly, for Jesus his body is a powerful medium for teaching. The journey starts from the stable in Bethlehem where he takes the human body, and continues through living among people, touching them (Mt. 8:3) and allowing to be touched (Lk 8:43ff); being baptised (Mt. 3:13ff), as well as being transfigured (Mt. 17:1ff); washing others feet (Jn. 13:1ff) and allowing his feet to be washed (Lk. 7:36), symbolically distributing his body in the form of bread (Mt. 26:26) and his body being broken down on cross (Lk. 23:33ff) as the climax of the story. Finally, the Church becomes to be called as the “Body of Christ” (I Cor. 12:27) as Jesus identifies his body with the Church (Acts 9:4). Jesus pedagogy is also relational in that sense. From her inception the Church “has lived her mission as a visible and actual continuation of the pedagogy of the Father and of the Son… [S]he proclaims, celebrates, works, and remains always a vital, indispensable and primary locus of catechesis (GDC:141). The pedagogy of the Church consists of the witness; a variety of ways of life and original forms of religious communication. Luke’s account of early Christian communities show that they were also defined by mutual relations (Lk. 2:42ff). Further, the Church has developed its own methods of catechesis, which includes story telling in allegorical language and enacting the Jesus’ story. Visuals became part of the Christian communication with iconography. The artistic renaissance of medieval Europe unravelled a world of images through paintings and carvings that depicted various Biblical events, characters and figures. They also had dramatic presentations of Christian themes. God’s Pedagogy as well as Jesus’ pedagogy shall serve as the foundation for catechesis even though it employs strategies such as creative use of AV and Theatre techniques. What does this mean? God’s choice of taking the flesh of humankind to embody his divinity is an attempt of translating the divine in human terminology. It signifies God’s willingness to embrace the culture of the humankind. God’s pedagogy becomes most effective in the fact that God was ready to stoop down to the lowliness of human beings so that He could be understood well by them. Adapting God’s strategy today one has to be able to decode the present day culture from God’s point of view and to talk the language of that culture. Our dynamic Popes have issued inspiring ideas and suggestions on these aspects that encourage us to understand the new culture and to speak its language. We cannot turn a blind eye to the possibilities this new culture offers. One of the fascinating innovations of the 20th century was the invention of movies. Church’s initial response towards films was cautious and ethical nonetheless the Church saw that movies could also serve as a means for advancing faith. Pope Pius XI appreciated the capability of good motion pictures in “exercising a profoundly moral influence” on those who watch them (Vigilanti Cura 1936). In Miranda Prorsus (1957) the Church welcomed the audio-visual media as avenues “for men to meet and unite in common effort” and expressed its desire to turn them as the extensions of furthering “truth and virtue.” Similarly Pius XII demonstrates an absolute confidence “in the Cinema as an effective and positive instrument of mental development, education and improvement” (The Ideal Film, 1955). Pope John Paul II appreciates the art of cinema because they have often dealt with themes of great meaning and value from an ethical and spiritual point of view (WCD Message 1995). However these documents also caution everyone about its evil potentials. Including movies in religious education and for purpose of catechesis can be called Cinema Catechesis. In Cinema Catechesis the catechist shows a full feature movie, or a shortened version of a movie or use certain sequences from movies as an aid for stimulating the participants on a particular theme to be taught on that day. Films can transcend the screen, and lead the viewers to think and reflect in ways the written or spoken words cannot. The compelling audio-visual experience and the following discussion engages the learners on multiple levels because film can stimulate a person’s imagination and interest fairly easy and effective way than when they attend a traditional class. In Cinema Catechesis the movie is used in order to facilitate discussion and use the experience as a springboard for reflecting further. The purpose of viewing films in cinema catechesis is not mindless entertainment or making class interesting, but to explore and reflect the underlying religious themes in order to grow in faith. Employing cinema falls within the framework of Divine pedagogy. First of all, God chooses an image – His logos in flesh – to teach him about his love. God also adapts to human culture. Cinema catechesis speaks a language of the postmodern generation and leads them to a higher level of reflection. The ultimate “power” of movies lies in its storytelling ability through a compelling audio-visual experience for the viewer. Movies or movie clips shown in cinema catechism is a means as well as the cultural language itself to communicate the postmodern generation. Secondly, by choosing and showing a movie clip the catechist is trying to construct a story. Here the catechist is resorting to a constructivist teaching strategy. In the constructive approach the teacher builds ideas upon students’ existing knowledge, beliefs, and skills (Brooks and Brooks, 1993). Constructivist approach follows a five-phased process known as the 5Es, namely the Engagement phase, the Exploration phase, the Explanation phase, the Elaboration phase and the Evaluation phase (Bybee, 2006). Within a constructivist learning process, the students rework their current experiences and knowledge received in prior learning and synthesise new understandings on the basis of newly encountered realities and information. It means that learners of all ages construct new ideas and meaning on top of their personal conceptual understandings (Eisenkraft, 2003). Cinema catechesis would include various phases of the constructivist approach. The exhibited movie or video has its own story already constructed by the director. In the learning proses the teacher with the engagement of the students deconstructs the film’s story. They critically engage with the text of the movie. Then the teacher guides them to the faith lessons inspired by the movie. They reconstruct new concepts and ideas from the movie and the catechism lesson. This should inspire them to appreciate their experience with Christ. Finally the students make their own plans to implement in life individually and collectively. Jesus is found to be doing a constructive approach in his catechesis (Robertson 2008). 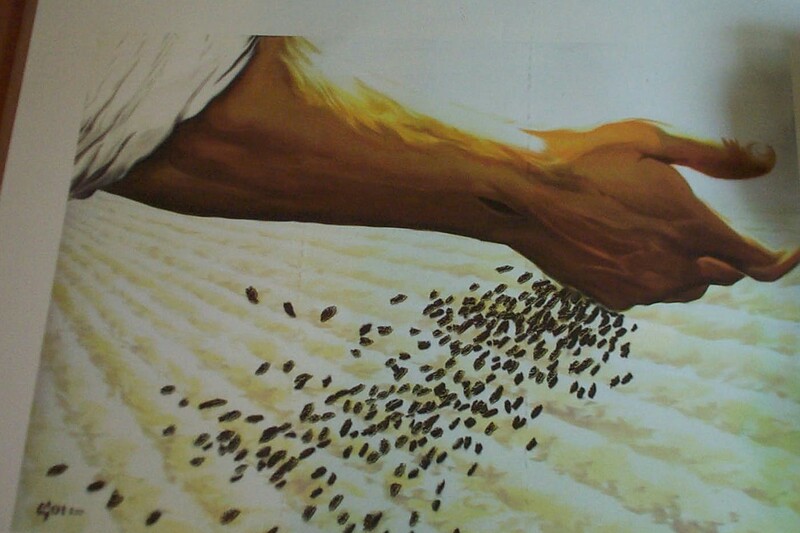 For example in the parable of the sower Jesus makes up a story out of listener’s life contexts. They know already about cultivation. The story builds tension with the four choices it makes for the listeners. They have to critically analyse the situation and opt for one choice. However, the story is not about cultivation, but about the Kingdom of God. From the prior knowledge the listeners are taking some new insights about the Kingdom. Thirdly, movie watching also has a ritual dimension. The ritual approach to media and communication is a recent development in the media and culture studies. Cultural scholars increasingly identify the ritual value of media (Couldry 2003), online media (Highland & Yu, 2008; Jenkins, 2008; O’Leary, 1996) and especially cinema (Leonard 2009, May & Bird 1982, Ungureanu Brădățan 2014). Brent Plate (2008) argues that the altar and the screen are structured and function in comparable fashion. The themes of many popular movies share many ideas of religion such as destiny, sacrifice and salvation (Herrmann 2003, Nayar 2012). If postmodern catechists need to make sense to the postmodern generation they need to go beyond the instrumental approach of just showing some clips or movies to a cultural approach of participation. Watch the movie and find if there are any eternal themes in it. Christmas Card -“The Gospel According to John.” An example for catechesis through visuals. The process of making this Christmas card (click the image to go to the page for more details and images) itself is a pedagogic process where body, mind, soul of a person along with logos, faith, and images work together. Theatrical performance is not alien to any culture (Watson & McKernie 1993) including that of India (Varadpande 2005). It has also been associated with the notion of the sacred and religious (Yarrow & Chamberlain 2007, Rupp & Döring 2005). While for the Early Indian (Malabar) Church, performance was part of the memorisation of the history as well as constituted the celebration of that history (dance forms such as Margam Kali and Parichamuttu Kali) (Barboza 1990, Choondal 1983), the European Christianity is known to have theatrical performance promoting Christian themes (Johnson & Savidge 2009). Theatre, as it offers a sacred stage that transcends time and space (Bryant-Bertail 2000), obviously is a fantastic medium for catechesis. The powerfulness of theatre lies in the fact that its primary medium is the performers body. Body is both a medium and metaphor (Westley 2008). It is a medium that communicates meaning (Shahshahānī 2004) as it can convey particular meanings through special ways of movements and the language it creates. Body is an essential element in the process of establishing intersubjectivity not only in theatre but also in any social relationship (Crossley 1996, Shepherd 2006). Moreover, recent studies have shown that bodies play an important role in religions as carriers of meaning, which both construct and interpret in metaphoric and concrete way (Coakley 1997; Furey 2012). With regard to the topic under discussion today, it is fascinating to recognise that the central aspect of divine pedagogy is God taking the body of human being. Similarly, the culminating point of pedagogy of Jesus is breaking his body on the cross. Reflecting a level above, the Catholic life revolves around the consecration, celebration and consumption of the body of Christ on a daily basis. For God the father and Jesus, body is the powerful medium of teaching God’s love to human beings. Body is not only a pedagogic tool but also an integral aspect of the pedagogy itself. Catechesis is an activity where the catechist is physically present in front of the learners. How s/he communicates is as important as what she communicates. His/her body is present and it makes meaning the way s/he talks, stands, moves, and articulates the message. Her/his voice – paralanguage, and the emotional resonance are important tools of meaning making. Above all how you live your life is more important than any catechetical instruction. The catechist’s body and life are the best tools in a powerful catechesis. This leads us to the fundamental idea about the authentic catechism modelled after divine pedagogy. Catechesis is a relational process in which the catechist builds a relationship with the learners through the way s/he communicates with her physical presence and body. S/he initiates and maintains a relationship with the participants in order to make Christ present and experiential for them. These insights discussed above presents the catechists with some challenges. First of all we are living in a context of drastic cultural change. This cultural change is catalysed and promoted by the technological advancements especially in the field of communication and media. In the postmodern culture “the sphere of representation has evolved dramatically… and traditional methods of self expression would no longer appear to be applicable. The myth of an integral self that is identical with self-image has been exploded, and we are left picking up pieces” (Westley 2008 p.7). It is very challenging in this context for the catechists to appropriate the language and skills of the postmodern culture and enter into a dialogue with the postmodern generation. Secondly, the challenge to be open to as well as following up the insights from papal documents on catechesis, i.e., the divine pedagogy and the pedagogy of Jesus. The best way for an effective catechesis is that the catechists themselves have to be authentic medium that embody the message of Christ (McLuhan 1964). Authentic catechesis would facilitate authentic culture of encounter as Pope Francis suggests (WCD Message 2014). He also invites us to take up such contemporary expressions: “We must be bold enough to discover new signs and new symbols, new flesh to embody and communicate the word, and different forms of beauty which are valued in different cultural settings, including those unconventional modes of beauty which may mean little to the evangelizers, yet prove particularly attractive for others” in the apostolic exhortation, Evangelii Gaudium (167). Having discussed these fundamental things, it is inevitable for us to make some fresh orientations. 1. Our understanding of catechesis must be very clear: Catechesis is “the process of transmitting the Gospel, as the Christian community has received it, understands it, celebrates it, lives it and communicates it in many ways” ( GDC :105). 2. We need to free our catechetical process being bound to books, texts and a syllabus. Though texts would serve as a framework as well as a functional tool the participants of catechesis should be facilitated to “encounter and build communion with Christ” (GDC:80). 3. We need to visualise catechesis detaching from the traditional context of classroom. Every occasion offers moments of catechesis for a committed catechist. Similarly we have to broaden the target audience of catechesis from children to include adult Christians as well who are to be catechised constantly. 4. We need to recognise that communication is a human achievement and not a technological one. Therefore, obsession with techniques and technology for the purpose of catechesis will only risk the heart and soul of it. “A technique is of value in catechesis only to the extent that it serves the faith that is to be transmitted and learned; otherwise it is of no value” (CT:58). Fullness of Christ experience and a passion to communicate that experience are the only two techniques the catechist should seek. There are some good examples of such catechism in the Gospel of John. 5. Catechesis shall be perceived as a relational process. The core of catechesis is facilitating the participants to experience Jesus which is primarily done through a dynamic and living relationship between the catechist and the participants. Looking at catechesis as a process of growing in discipleship we need to redefine the methods of catechesis into more relational approaches (Reichert 2002, Root 2007). Any novel strategy for improving the outcome of catechesis shall follow the Divine pedagogy as well as Jesus’ Pedagogy. They invite us to redefine our catechetical contexts and content in dynamic ways in order to converse with the postmodern cultures. An authentic way of doing catechesis is to build up on relational catechesis, which “focuses on community as a corporate body, “the body of Christ” as well as on the individuals as the members of the community” (Mongoven 2000 p. 142). For that matter cinema catechism will enhance catechism with novel ways of visualising catechesis and engaging with the visual texts reflectively from a biblical, theological and spiritual perspective. Incorporation of theatre will help students appreciate the mystical body of Christ in a better light as well as being an integral and interactive part of that body. These approaches would dynamically improve not only the catechesis but also the very Christian living as well as the way it organises faith communities. Barboza, F. P. (1990). Christianity in Indian dance forms. Delhi, India: Sri Satguru Publications. Brooks, J. G., & Brooks, M. G. (1999). In search of understanding: The Case for constructivist classrooms. Alexandria, Va: Association for Supervision and Curriculum Development. Choondal, C. (1983). Christian folk songs. Trichur, Kerala: Kerala Folklore Academy. Coakley, Sarah (ed. ), (1997). Religion and the Body, Cambridge: Cambridge University Press. Couldry, N. (2003). Media rituals: A Critical approach. London: Routledge. Crossley, N. (1996). Intersubjectivity: The Fabric of social becoming. London: Sage Publications. Eisenkraft, A. (2003). Expanding the 5E model. The science teacher, 70(): 57-59. Furey, Constance M., 2012, Body, Society, and Subjectivity in Religious Studies, in: Journal of the American Academy of Religion 80,1, 7–33. Harvey, J. (2013). The Bible as visual culture: When text becomes image. Sheffield: Sheffield Phoenix Press. Herrmann J. (2003). From popular to arthouse: An Analysis of love and nature as religious motifs in recent cinema. In J. P. Mitchell, & S. Marriage (Eds.) Mediating religion: Conversations in media, religion and culture (pp. 189-). London: T & T Clark. Highland, M., & Yu, G. (2008). Communicating spiritual experience with video game technology. Heidelberg Journal of Religions on the Internet, 03(1), 267-289. Jenkins, S. (2008). Rituals and pixels: Experiments in online church. Heidelberg Journal of Religions on the Internet, 03(1). Leonard, R. (2009). The Mystical gaze of the cinema: The Films of Peter Weir. Carlton, Vic: Melbourne University Publishing. McLuhan, M. (1964). Understanding Media: The Extensions of Man. New York: McGraw. May, J. R., & Bird, M. S. (1982). Religion in film. Knoxville: University of Tennessee Press. Mirzoeff, N. (2002). The Visual culture reader. London: Routledge. Nayar, S. J. (2012). The Sacred and the cinema: Reconfiguring the “genuinely” religious film. New York: Continuum. Niehaus, Jeffrey J. (1995). God at Sinai: Covenant & theophany in the Bible and ancient Near East. Grand Rapids, MI: Zondervan. Osborne, K. B. (2009). A Theology of the church for the Third Millennium: A Franciscan approach. Leiden: Brill. Plate, S. B. (2008). Religion and film: Cinema and the re-creation of the world. London: Wallflower. Savran, George W. (2005) Encountering the divine: Theophany in Biblical narrative. New York: T & T Clark International. Reichert, R. (2002). Renewing catechetical ministry: A Future agenda. New York: Paulist Press. Root, A. (2007). Revisiting relational youth ministry: From a strategy of influence to a theology of incarnation. Downers Grove, Ill: IVP Books. Rupp, S., & Döring, T. (2005). Performances of the sacred in late medieval and early modern England. Amsterdam: Rodopi. Ungureanu, C., & Brădățan, C. (2014). Religion in contemporary European cinema: The Postsecular constellation. London: Routledge. Varadpande, M. L. (2005). History of Indian theatre: Classical theatre. New Delhi: Abhinav Publications. Vallikatt, J. (2013). Kanunnavar jeevikkum: Utharadhukika yugathinu preshita darshanam (Mal.). Kottayam: OIRSI. Watson, J., & McKernie, G. F. (1993). A cultural history of theatre. New York: Longman. Westley, H. (2008). The Body as Medium and Metaphor. Amsterdam: Rodopi. White. J. (2014). Way God Teaches: Catechesis and the Divine Pedagogy. Our Sunday Visitor. Yarrow, R., & Chamberlain, F. (2007). Sacred theatre. Bristol, UK: Intellect.